"Fire, Air, Earth, and Water. I can deal death with any of them." The elementalist channels natural forces of destruction, making fire, air, earth, and water do her bidding. What the elementalist lacks in physical toughness, she makes up for in her ability to inflict massive damage in a single attack, dropping foes from a distance before they can become a threat. Yet, despite her incredible offensive potential, versatility is what makes the elementalist truly formidable. Rather than swap weapons to adjust to new situations, the multi-faceted elementalist quickly adapts to new threats by attuning to different elements as needed. When the elementalist attunes to any of the four elements, she receives intrinsic bonuses that continually empower her. With FIRE attunement, the elementalist can inflict scorching damage on multiple enemies by turning the ground to fire or raining down molten rock from the skies. Why kill just one enemy when you can burn them all? 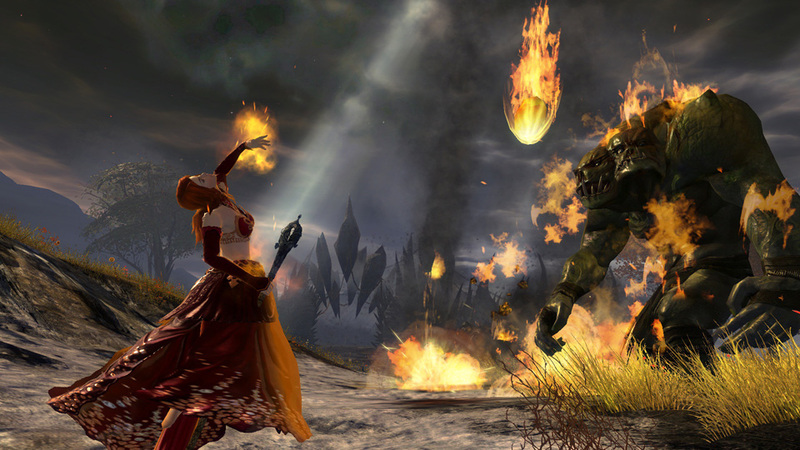 Just by attuning to fire, the elementalist automatically causes flame damage to any foe foolish enough to touch her. When the elementalist attunes to AIR, she can harness wind and lightning to target specific foes with focused, high-damage attacks. 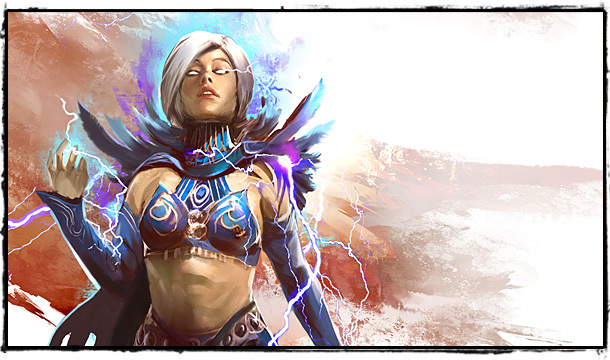 Dazzling bolts of lightning rip from the elementalist's fingertips, and brilliant flashes of light blind her enemies. 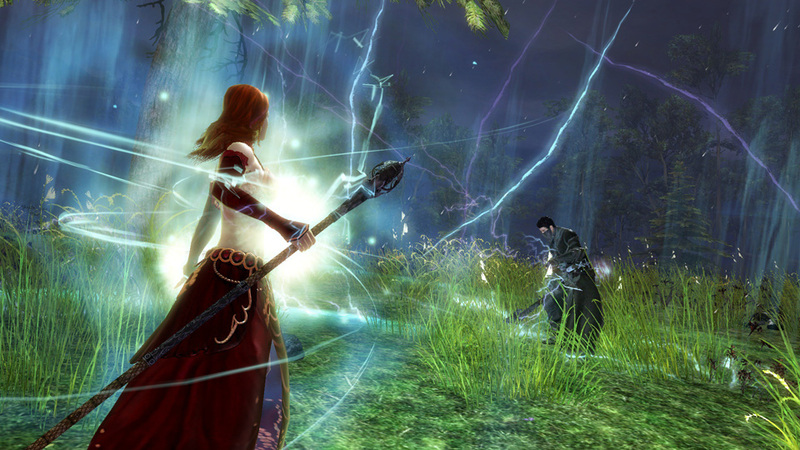 When an elementalist attunes to air, nearby enemies are continuously pelted with lightning strikes. WATER attunement forgoes the raw damage of air and fire, in favor of controlling an opponent's movement. By creating slippery ice or freezing foes solid, water attunement ensures that the battle is always fought on the elementalist's terms. 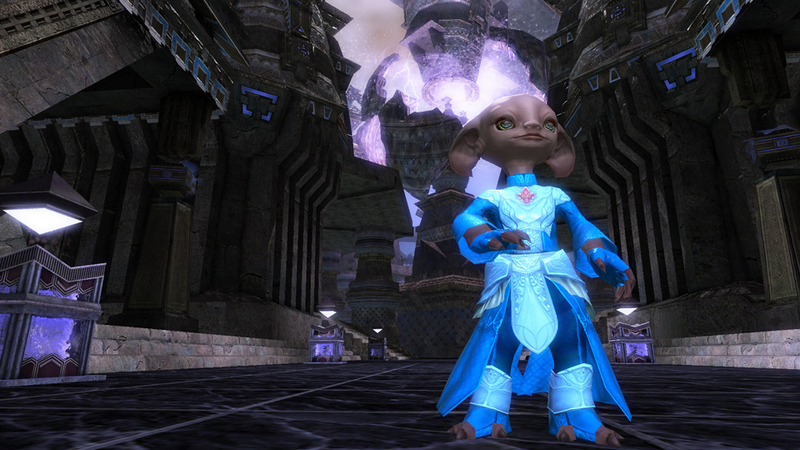 Nearby allies receive continuous healing from an elementalist who is attuned to water. In the most dangerous situations, the elementalist relies on the powerful defense of EARTH attunement. An earth elementalist uses the ground under her feet to defend herself and her allies, turning flesh to stone, destabilizing foes with seismic shocks, and destroying threats with volcanic eruptions. Earth attunement automatically confers magical protection to the elementalist. Glyphs—These arcane spells enhance or modify the natural power of the elementalist. She uses the Glyph of Elemental Power to increase the damage, range, and duration of her spells. Signets—Signets provide an ongoing benefit to the elementalist, but can also be activated for a greater effect. An elementalist equipped with the Signet of Earth has increased damage resistance, but activating the Signet sends out a wave of stone, stunning nearby enemies. Conjure Spells—The elementalist uses Conjure spells to summon useful items and potent weapons that she or other party members can use. For instance, she uses Conjure Flame to create a fiery rock to hurl at the enemy. 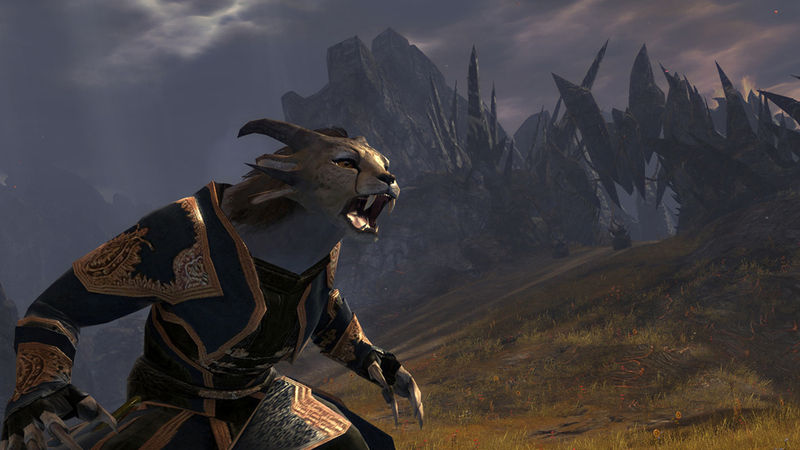 Area Spells—Using Area spells, the elementalist creates hazards and mayhem all over the field of battle. The elementalist fires lava arrows in a cone-shaped blast or creates walls of fire that scorch any enemies passing through. The elementalist has four elemental attunements that they can tap into. These attunements are represented by four skills that are located on the bar above their normal skills. When an elementalist switches attunements, the first five skills on their bar will change. These five skills are based on the elementalist's attunement and their current weapon, so that a fire-attuned elementalist will have different skills when he wields a staff than when he wields a scepter or focus. In addition to changing the elementalist's skills, attunements also work like a normal skill and provide an ongoing effect. Scepter (Main Hand) — Scepter skills specialize in close range combat. Dagger (Main Hand) — Main hand daggers are fast and focus on medium range spells. Staff (Two Handed) — Staves are slow casting long range weapons. Dagger (Off Hand) — Off hand daggers specialize in powerful medium range abilities. Focus (Off Hand) — Skills on a focus are powerful close range abilities.